Global leaders continue to send their telegrams and letters of congratulations on the occasion of Kassym-Jomart Tokayev becoming the new President of Kazakhstan, Trend reports citing Kazinform. Having highly appreciated joint work with the First President of Kazakhstan - the Leader of the Nation, in his telegram US President Donald Trump noted that he looks forward to productive relationship with Kassym-Jomart Tokayev. 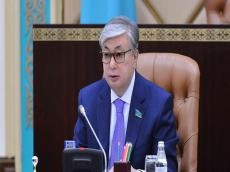 He extended his congratulations to President Tokayev on assuming the post and on the occasion of Nauryz holiday wishing the people of Kazakhstan happiness and prosperity. The US Department of State praised the contribution of the First President and the Leader of the National Nursultan Nazarbayev in establishing and promoting enduring, dynamic relations between the United States and Kazakhstan.